Two days ago, KoopaTV published an article regarding Paper Mario: Color Splash and the newly-revealed "Black Bowser." That's right, Black Bowser. 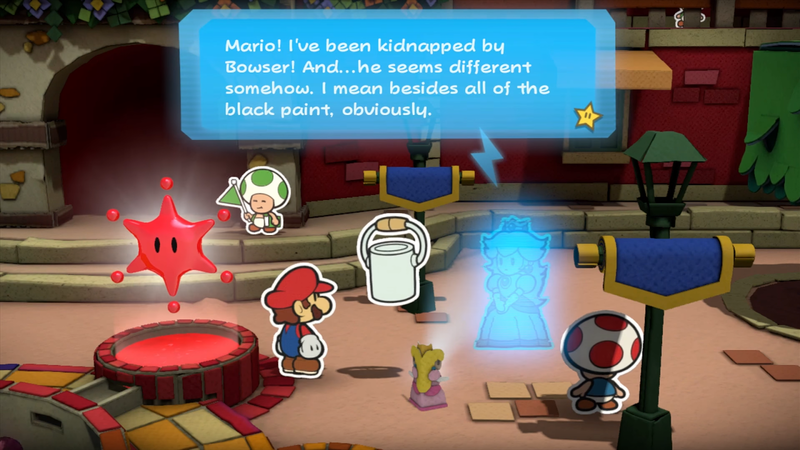 An otherwise-innocent Bowser coated in mysterious black paint, mysterious enough to make Hologram Peach point out that "he seems different somehow." This raises questions about other members of the Koopa family who seem a little "off." Take Morton Koopa Jr. and his peculiarities that we live-reacted to. It was assumed three months ago that Morton had simply been brain-stomped one time too many, but recent Color Splash developments in the past few days — specifically involving said BLACK paint — suggest there may be way stranger influences at play here. In fact, I think it's time to bleed this preamble like a stuck pig and let Morton speak for himself. Rawk is going hard in the paint with the audiovisual content. If the above performance changed your view on Morton Koopa Jr. or anything else, let KoopaTV know in the comments below! If that performance didn't change your view on Morton Koopa Jr. then how about this speech of his? I'll never see Morton the same way again. Okay, since Rawk is just never going to reply to this, I will. ...I won't see him the same way again either.